I’ll be starting my annual Christmas baking in a few weeks. Every year, I bake a variety of sweets to have on hand for the holidays. 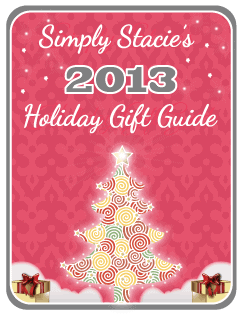 A few of my all-time favourites include peanut brittle, chocolate haystacks, peanut butter fudge and shortbread cookies. I’ll probably include a few new ones this year. I’ve found a bunch on Pinterest that look so scrumptious! 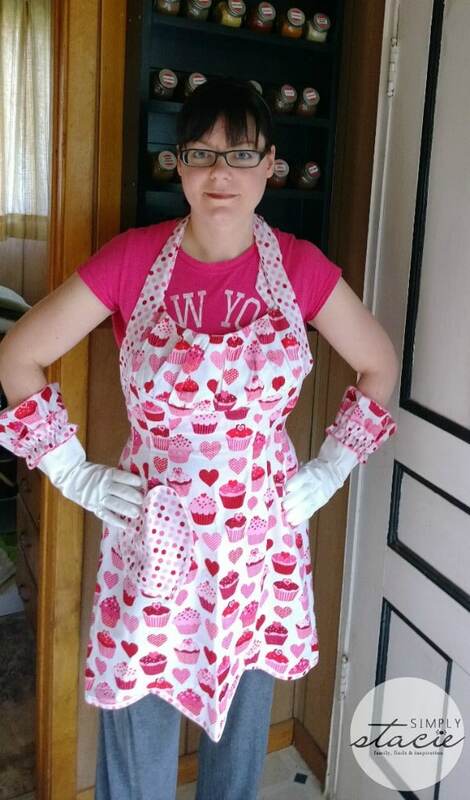 What’s different this year is that I’ll be baking in style! I’ll be wearing my gorgeous new Carolyn’s Kitchen apron while I bop around the kitchen to Christmas music. 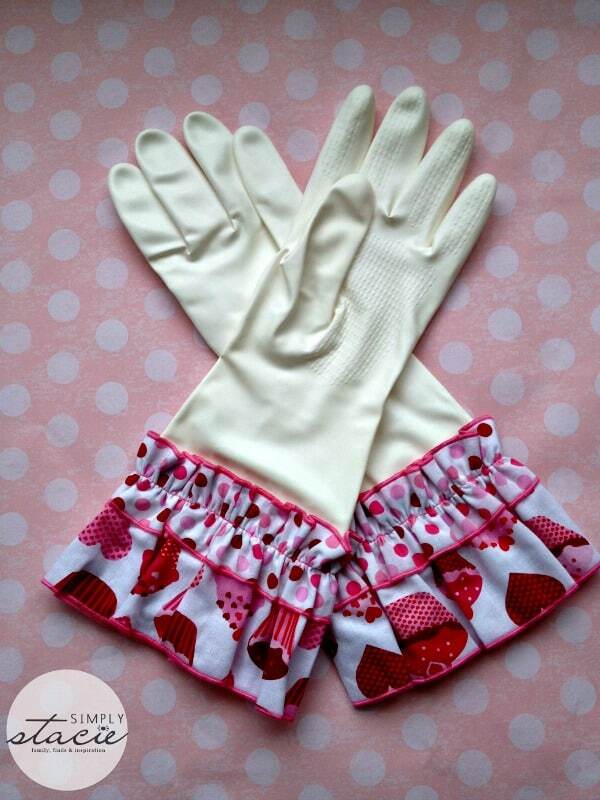 For the huge clean up task, I have a fun (and functional) pair of dish gloves to wear too! Cilantro Cooks sent me two items from their Carolyn’s Kitchen product line: Carolyn’s Kitchen Heart Cupcake Apron and matching Carolyn’s Kitchen Heart Cupcake Dish Gloves. I feel like a domestic diva when I wear them! Their vintage-inspired dish gloves are made one size fits most. I have small hands (John calls them little kid hands) and I found that they were very comfortable and roomy. 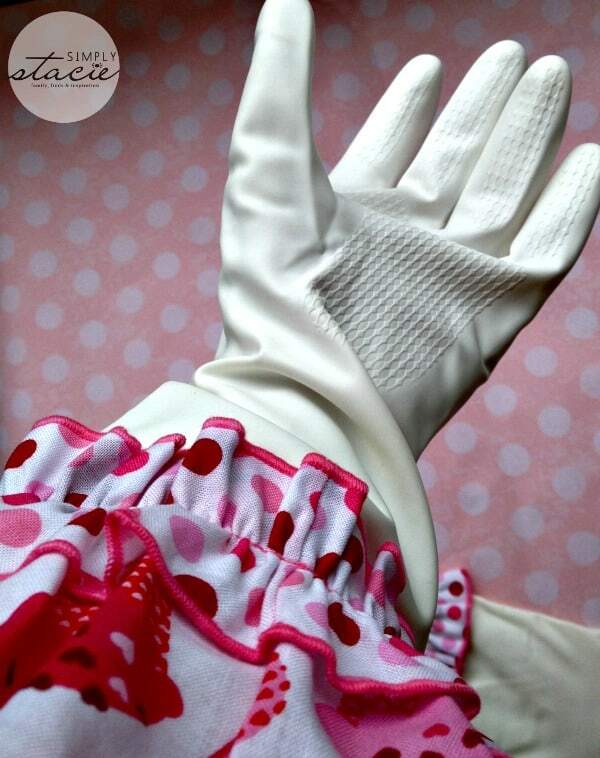 The glove portion is made of vinyl hypoallergenic with a soft flock lining. I appreciate that they are latex-free since I am latex sensitive. The gloves measure 14″ long and that includes the 100% patterned cotton cuff. Who knew that dish gloves could be so nice? They say you can wear them for hours without sweating too! I haven’t had to wear them for hours at a time just yet. That time will be coming up over the holidays. I think that’s an important attribute though. Hot and sweaty hands are the worst. Notice that one side of the glove is textured? That helps a lot with grip and so you can firmly hold the wet, slippery dishes. 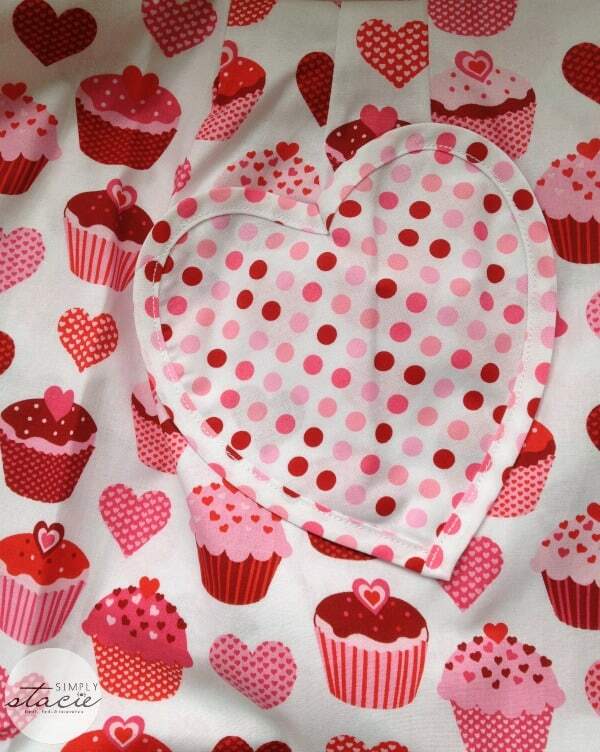 I absolutely adore the Heart Cupcake apron. The colours are so me! Pink and red are two of my favourite colours and the design is both fun and feminine. I definitely feel more glamourous when I put it on. It beats cooking in sweats and a t-shirt! The cut is also very flattering. It ties so it’s fitted at the waist and I like that it hides my problem areas! It measures 28 inches long and on me it goes to about my knees (I’m 5’6). There’s also a front pocket in the shape of a heart you could stash your cell phone in. I always multi-task in the kitchen. I’ll be cooking (or baking), chatting on Facebook and sharing pictures of food on Instagram. The material is 100% cotton and can be washed in cold water and tumbled dry on low. It’s fashionable and low maintenance and easily folds up to put into my apron/placemat drawer in my kitchen. 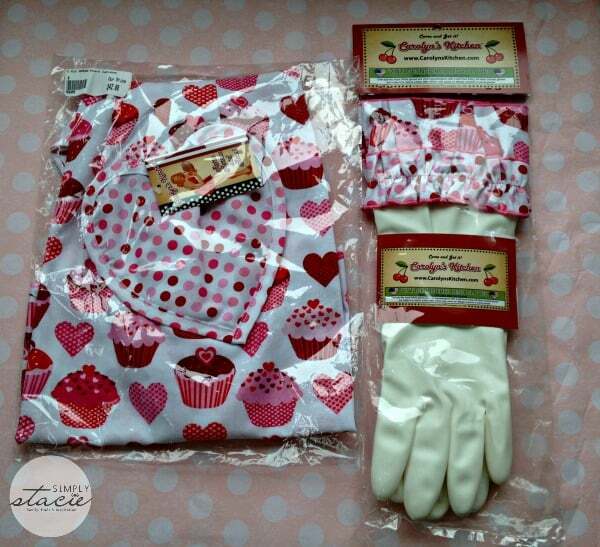 The Carolyn’s Kitchen Heart Cupcake Apron and Dish Gloves are $42 and $22, respectively, on Cilantro Cooks. They also have other styles and patterns you can check out too. If you need a gift for a friend or loved one who enjoys entertaining or spending time in the kitchen, an apron with dish gloves would be a wonderful gift to give them. Cilantro Cooks has free ground shipping on orders over $50 in both USA & Canada and they accept both Paypal and credit card for payment. Happy shopping! Ooohh – the pizza stone! Norpro Davy Crack It Squirrel Nutcracker, Regular price: $26.00 …. What a fun/perfect nut cracker , its adorable ! Wwo i need everything I have nothing since i became semi homeless. Love th BIA Cordon Bleu mortar + pestle green. then the ironwood individual salad bowls are awesome. I’ve wanted a Dutch oven since forever. Lodge 6 Quart Dutch Oven, Pumpkin Color is so tempting! I like the French Bull Multidot Chefs Knife, 8 Inch. Thanks. I would love to try everything, but I will start with the French Bull Raj Chef Knife. I like the OXO Good Grips Cookie Press. I would love to have the Emile Henry Ruffled Square Baker, Fig. I would also love the Cuisinox Elite 6.5 Quart Covered Dutch Oven! Perfect for cooking warm meals this winter! That JJA So Fresh So City cappuccino cup set looks SO cute! I’d love to have it. I like the Browne 6 inch stainless steel icing spatula. I’d love the Korkmaz Silvia 9 Piece Cookware Set, Red. I would love one of the Dutch Ovens. I also want a Joseph Joseph Small Spoon Colander, Green. I did have to stop looking though – life called! I like the Cuisinox Elite 6.5 Quart Covered Dutch Oven. I like the colorful patterned knives on their website.. very cute! I like the Fox Run Paddleboard Regular. I like the Cuisinox Vacuum Insulated Carafe,. I would love to have the Calphalon Classic Bakeware 12-by-14-inch Nonstick Medium Insulated Cookie Sheet, this would be so helpful with my holiday baking. The Oxo Goodgrips cookie press. I’d like to have the Korkmaz Divani Copper Frypan. I like the Tatami mattress. I’d like the silicone muffin cups. i like the Cuisinox Stainless Steel Double Walled Coffee Press 1lt. I would like to have the Cuisinox Pressure Cooker, 7L!